Although Lake Manitoba was named lac des Prairies in 1738 by La Verendrye, Aboriginal people knew these waters as the “narrows of the Great Spirit” (in Cree, “Manito bau”). In stormy weather, waves crashing on the limestone rocks of the narrows resounded eerily, and people believed the sound came from a huge drum beaten by Manitou. In 1868, Thomas Spence of Portage la Prairie attempted to create a republic outside the District of Assiniboia to be named Manitobah. His plan failed, but a year later when he joined Louis Riel’s council at Fort Garry, Spence’s choice was selected as the name of the new province, and the letter H was dropped. 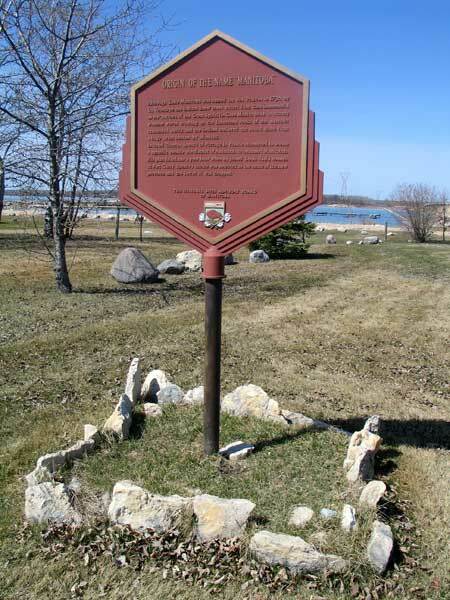 A commemorative monument was erected by the Manitoba Heritage Council. An Over-Simplified Plaque, Origin of Manitoba by C. V.